Attending a wedding at one of the Whitsundays most prestige wedding venues "Villa Botanica", well contact us today with your unique wedding code to find out more about our special accommodation packages available. We can cater for couples to large families in our range of 1, 2 and 3 bedroom self contained ocean view apartments. Looking for a romantic getaway ? How about coming to the magical Whitsundays. Do you want 2 free nights in Airlie Beach? 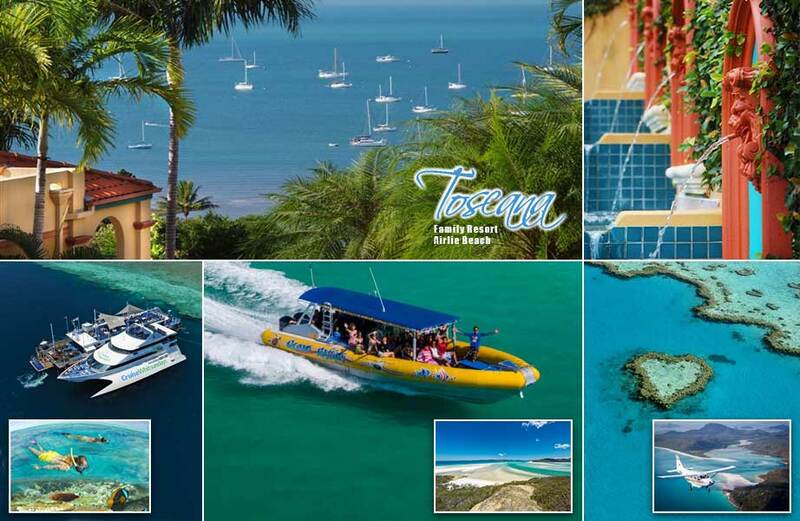 1st February to 31st March, Toscana offers 2 bonus free nights when you pay for 5 Save $ on accommodation to spend on fun and adventure experiencing the Great Barrier Reef, sailing in maxi yachts, game fishing, jet ski safaris, crocodile safaris, parasailing, resort island hopping... So many adventures... just waiting. The Whitsundays is such an iconic destination, we suggest you take a few extra days and combine the special event and make a great holiday experience. Spacious ocean view apartment style accommodation, centrally located just 200 metres walk from cafes, restaurants and shops. We have combined 5 nights accommodation with two of the most popular local tours to give you a taste of the Whitsundays. A twin island tour visiting Daydream Island with its wonderful living coral garden, fish and stingray feeding display, beautiful walks and lots of water activities. A very pretty little island resort and highly recommended. Then enjoy a 30 minute cruise to Hamilton Island for a delicious lunch. Feel free to explore the island using the Shuttle bus service. Perhaps a visit to the Wildlife sanctuary, stroll around the shops, visit the galleries or try the bowling alley. Would you like to share chatter, wine/ beer and nibbles? 5 nights ocean view apartment central Airlie Beach location - 200 metres to beach, cafes, restaurants. Enjoy an afternoon cruise to the world famous Whitehaven Beach with its spectacular white silicon sand. Swim in the pristine clear water take a stroll along the beach or just relax and soak up the sun. The next morning you are off to visit Daydream Island where you will see the living reef lagoon and public fish feeding daily at 10am and then you will travel to Hamilton Island where you will have time to enjoy lunch at the Marina Tavern and relax by the pool. Contact us today for our current prices - this package is available to families and couples. © 2017 toscana village resort all right reserved.